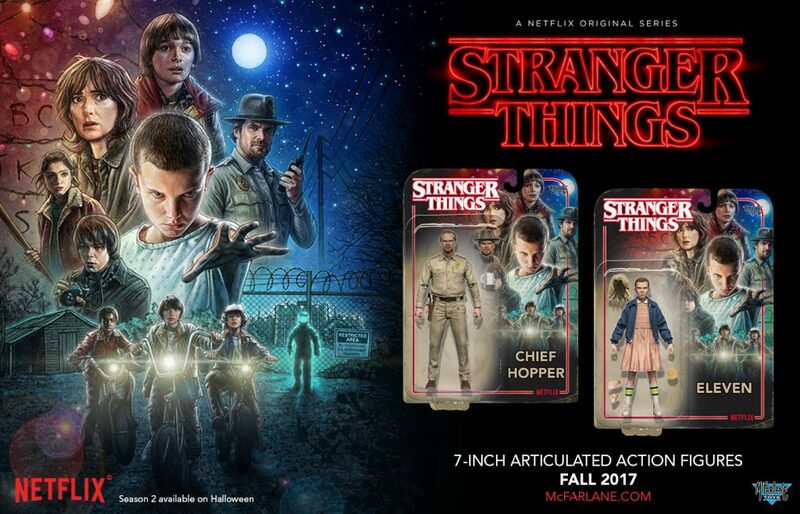 Here’s a preview for the upcoming McFarlane Toys Stranger Things 7 inch action figures featuring Chief Hopper and Eleven. Here’s the product description for the McFarlane Toys Stranger Things figures. From the Netflix TV series Stranger Things comes these 7-inch scale action figures! 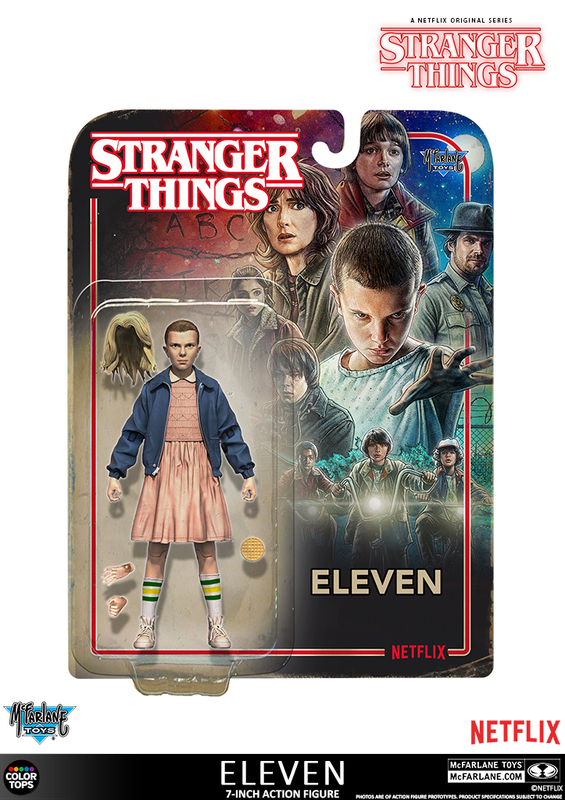 The Stranger Things Action Figures are highly detailed and articulated action figures of iconic characters Eleven and Chief Hopper sculpted from assets taken directly from the series. The figures are in 7-inch scale with 12 points of articulation for dynamic posing and feature show-accurate attires with accessories included. The figures come in a retro-themed packaging. Eleven stands about 5-inches tall, is sculpted from images of actress Millie Bobby Brown, and comes with removable blonde wig, radio, and waffle. Eleven is featured in dress and jacket outfit. 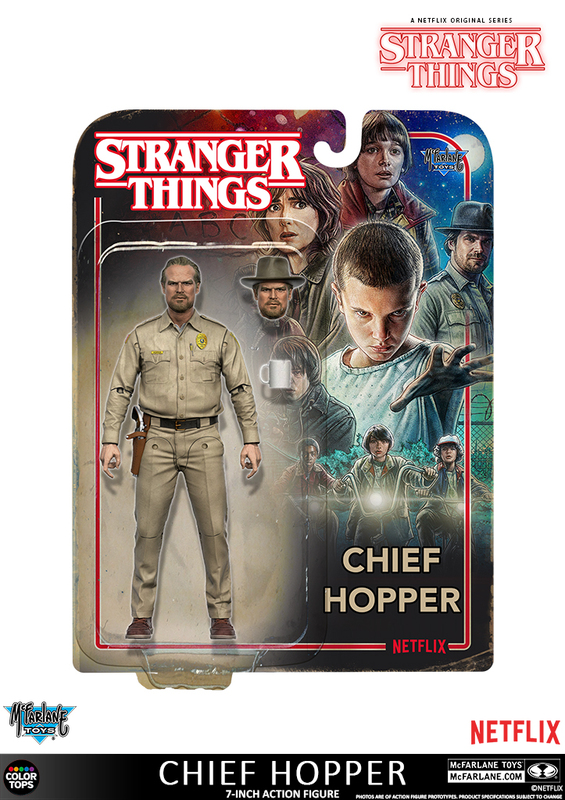 Chief Hopper is sculpted from images of actor David Harbour and comes with a removable Sheriff’s hat, pistol, and coffee mug. The figure is featured in sheriff’s outfit worn by Chief Hopper. Both figures feature a stylized Stranger Things-branded display base and are showcased in retro themed packaging. The McFarlane Toys 7 inch Stranger Things action figures will retail at $19.99 per figure and will be available this Fall in the US.